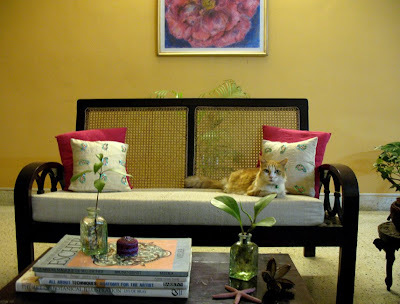 Priya Sebastian~ an illustrator, a blogger, a cat-lover, and a Bangalorean shares her beautiful and serene home with all of us today. A home surrounded by the lush greenery of her magical garden. Cindy her cat relaxing on her sofa. Priya says, "I like clean lines and unfussy rooms. Not only does openness and lack of clutter give me breathing space, it also makes maintenance far easier." 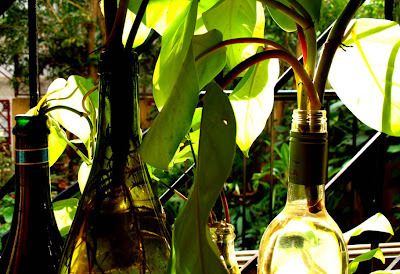 The plants in her various bottles form such lovely design elements. Warm tones and dark browns are splashed with hints of Priya's favourite colour – deep pink. 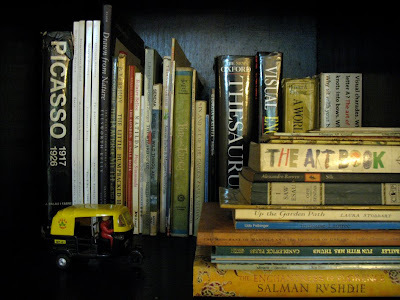 The rest of the colour comes from books on the shelf and from green plants dotted within the rooms which are an extension of the wild garden just outside. The Grand Piano is such a stunning piece against the warm coloured walls. 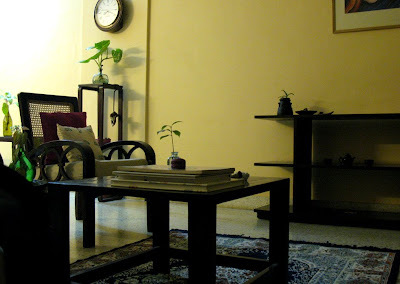 Priya says,"The room in my apartment that I use the most is my active studio which alternates between chaos and tidy. 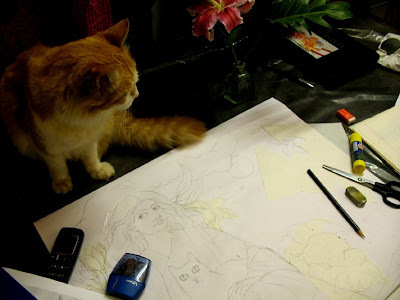 More often than not, it is strewn with paper, pencils, charcoal dust and a cat." Whenever I see plants in glass bottles I can think only of Priya. 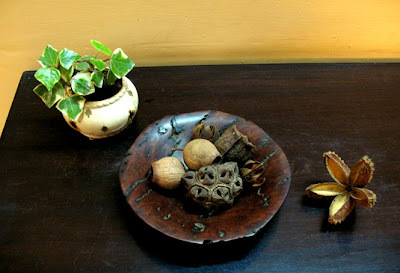 She has used such simple arrangements so effectively in her home, what a grand way to bring nature into your home! Her space reflects the warmth and the creativity that she is endowed with. Thanks Priya for sharing your gorgeous home with all of us! P.S~ If you have any questions for Priya about her home, please ask in the comments section so she can reply to you. I love the simplicity and the warmth of her home. All those greens.. what a lovely place to rest, especially on hot summer days! Very nice! ahh Priya's lovely nest and her stunning garden!... Love it. Priya ..great garden! you definitely do have a green-thumb. Love the vines in the bottles. Elegant decor Priya. I have a question abt the plants. I know that ivy (money plant) can be grown in a botte. I see others in the pictures. What are they ? Pls. let me know. 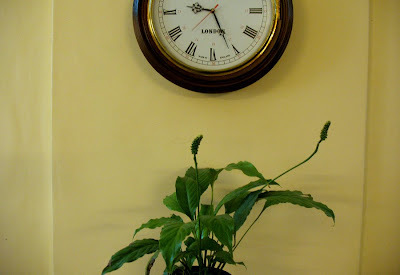 Love the unfussy straight lines and simplicity of the house Priya.A house with all Lovely greens in tall bottles.A warmth and coolness in total.I have tried growing them so many times,but ultimately they become yellow and the stem remains.If any tips please archana,if you could share. this is such a great series...thanks for starting it... priya's house is so warm....love the plants....and the sofa...and cindy!! her house is so simple and full of greens! I love green! Love Priya's space. I have the same queries as the others. While I have grown money plants in bottles , never tried the same with other plants. Please let us know what other plants can be grown in bottles? 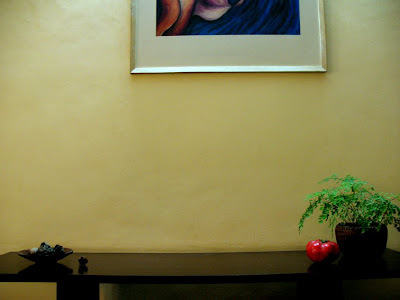 You know Arch, the 1st thing I asked Priya when i saw a few pics of her home on her blog was this " Are all bangalore homes these leafy pretty villas, with an air of quiet & warmth?" I find something similar in her home & my friends home that I just featured. Maybe it is the warm walls, maybe it is the many plants & maybe it is the unique spirit charachterised by the strong women that live here. Priya, you truly have a lovely home. I think the weather is something that really helps in growing some lovely plants. I love the bookshelf on the piano, the clean lines. I also wanted what plants other than the money plant can grow in bottles? 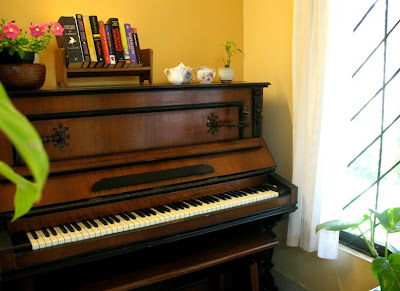 Loved the piano corner - Beautiful...Loved the simplicity...beautiful house. Thank you each and every one of you who has stopped by to visit and comment. It is heart warming. And thank you too Arch, for constantly appreciating my house and my work. I am truly touched. I simply do not know the names of most of the plants except the ever green Money Plant. I find that most of the non - flowering creepers, the ones that you can wrap around a moss stick, can be cut and put into bottles. They invariably grow roots and thrive. I keep rotating my bottles constantly. I never keep them within the house for very long. They seem to last this way. 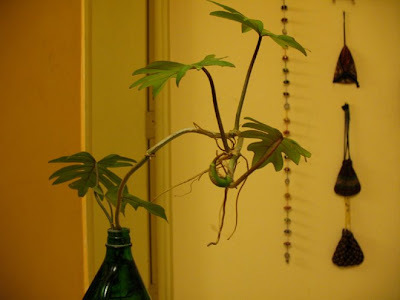 I do sometimes experiment by taking a cutting and placing it in a bottle and watching to see if it grows. If it puts out roots, then it stays in the bottle quite happily, otherwise it gets planted back in the ground again. I hope my suggestions were useful, and I do apologize for not knowing the names of the plants. 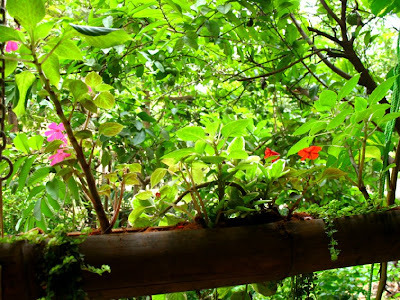 The wild garden outside your balcony/ window is so lovely, and the mud filled railing that allows more greens to grow! Thanks for featuring Priya's home. A beautiful home. I love how effortlessly Priya has brought the outdoors inside, with plants, flowers, leaves and pods. I love the clean and unfussy lines too. I am mesmerized by the green bottles in the sunlight. Gorgeous. 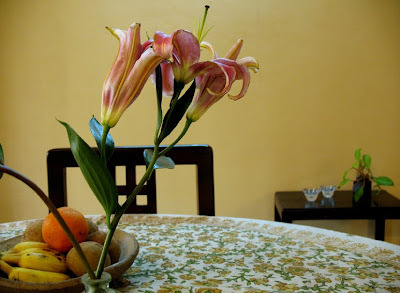 Thank you for sharing a glimpse of Priya's home with me. I adore Priya not only as an artist but also as a human being. Priya is one of my very favourite people. Thank you for sharing her home. And do I spy a gum nut in that collection of seeds? She uses very warm and inviting colors in her home. The garden is simply beautiful. Thanks for sharing these! I am a big fan of both of Priya's blog, and I believe I have seen some of these pics in Priya's blog too. I said then, and I will say it again - I love the piano :) (it's not a grand piano though Arch). It's almost like the one owned by music teacher when I was a kid. I also love the old world charm of her wood and rattan (?) Indian sofa. It so reminds of me of old Bangalore. Beautiful taste. Sharon- Oh it is not a Grand Piano? Oh, the beautiful symmetry, the stylish simplicity, the tranquillity. It is gorgeous in every possible way. The artist in her shines through, doesn't it? Lovely. 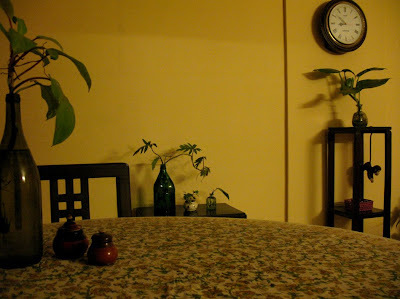 The greens make Priya's home effortlessly warm and cozy!! I love the piano corner.. and all the greens... everywhere!! Lovely! Priya's home is so welcoming. It's the home of an artist. I would be very happy there. such a lovely home. with wonderful furniture. Do you play the piano often? I love those green bottles with greenery pouring out of them. Still Water: I play the piano as often as I can. Sunita: Then I hope you come to Bangalore very soon! Truly a warm home. Liked the coziness of this home ! Lovely Elegant, Clutter free Minimalistic home! Nice bottled greens you have tr of anthuriums, pothos and similar families. I have never liked the "Concept of artificial plants"
I've started bottling greens too and im experimenting with bottling gardens. Got it from my momy who has bottled plants for nearly 20yrs now! Try out some more plants like Mother in laws tongue,Syngoniums( commonly available) and also the marble queen. 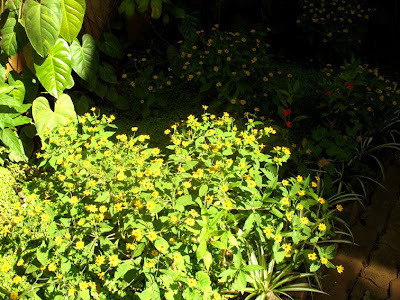 they need shade and humid conditions grow well indoors especially in water. 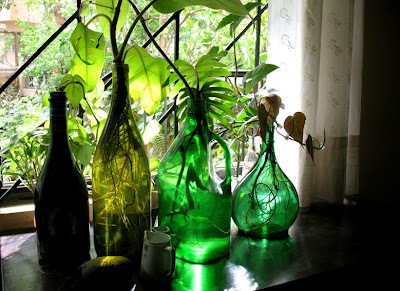 Love the concept of planting green plants in those bottles in different hues of green.such a treat to the eyes.